Reader question… “I recently made two ingredient cookies for my toddlers. I had seen dozens of people raving about this recipe on social media and how amazing these cookies are but I thought they were quite awful. I made the banana and oats recipe and the cookies were tough and very bland. I made the recipe a second time and added a few raisins for sweetness, but the cookies were still tough and the taste wasn’t much improved either. I wondered if you have made this recipe and if yes, what is your opinion of two ingredient cookies? Also do you have any tips that would counteract the heaviness and toughness?” –Janice L.
Until I read your question I had never made the two ingredient cookies. I have since made them twice. With the first batch I followed the recipe exactly so the cookie “dough” was simply a mixture of one cup of mashed bananas and one cup of ground oats. 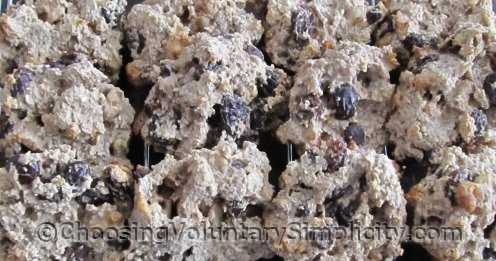 For the second batch I added a half cup of plumped raisins and a quarter cup of chopped walnuts. The raisins did add a bit of sweetness, but I don’t think the raisins or the walnuts added anything positive to the flavor or texture except more “chewiness” and these cookies have more than enough of that already! Also, the raisins and nuts just sort of “sit there” in the dough, because of course this dough does not rise around them. This is not an attractive cookie. The two ingredient cookies are tougher than regular cookies because they don’t contain any shortening. The two ingredient cookies are heavier than regular cookies because they don’t contain any leavening agent like eggs, baking powder or baking soda. And as long as the only ingredients are bananas and oats, the cookies are bound to be somewhat tough and somewhat heavy. I actually thought the “dough” tasted better than the baked cookies. Like you, I thought the cookies were bland and heavy… I wouldn’t make them again. My family never says no to a cookie, and these were no exception… they disappeared quickly… although everyone agreed that two ingredient cookies, with or without changes to the recipe, were nowhere near as good as the regular cookies I usually make. However, that isn’t a fair comparison. The two ingredient cookies are what they are. To someone who can’t eat regular cookies because of diet restrictions or allergies, a two ingredient cookie can, I think, taste pretty darn good. I appreciate your honesty. The 2-ingredient cookies are (as you said) – what they are. If someone can’t have home baked cookies or doesn’t want to eat sugar or oil or any of the other things people are avoiding these days – the 2-ingredient cookies are ok, I guess. I’m glad my health is such that I can still enjoy an occasional ‘real’ cookie. I’m 89 and don’t bake much anymore but I used to. Has anyone made 3-ingredient peanut butter cookies? These aren’t healthy so the advantage must be the quickness. I tried them but they are overwhelmingly sweet. I would rather take a few minutes more and make regular peanut butter cookies. I make the banana/oats cookies for my daughter who is allergic to eggs, has a gluten intolerance and other food sensitivities. She has never had anything else so she likes them quite a lot. Recipes like these *do* as Shirley said serve a purpose. It’s so difficult to cook or bake if practically everything is off limits.